We just came back from 3 weeks in Chile. 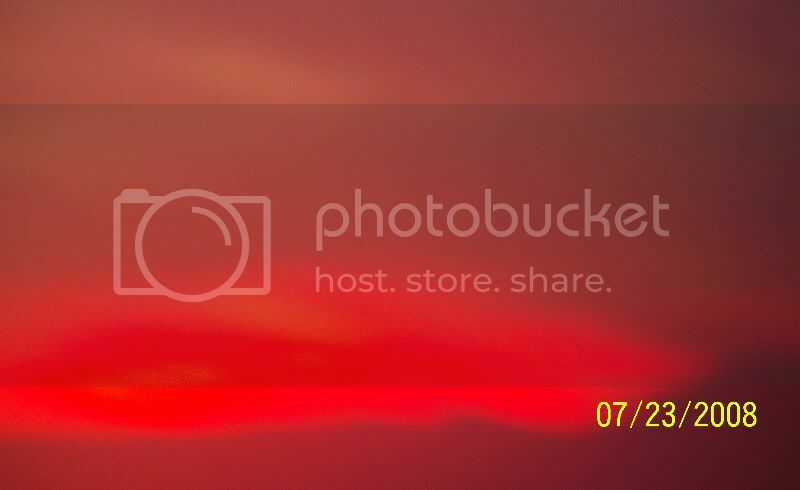 The post below narrates our adventures from July 7 - July 21. Because of the length, I will describe the remainder of the trip in a 2nd post to follow this one. Started out late for the plane, long line at check-in, don't know if they'll take all our luggage. We have a hard shell rolling carrier for the skis and poles, two large and heavy suitcases, backpacks containing boots, jackets, etc, and various other carry-ons. Amazingly they take our skis bag and overweight luggage with no complaint - remember we are flying LAN which is part of American Airlines who first started charging a fee for checked luggage. Make it through TSA with no problem. Our seats are almost in the last row and I ask the stewardess in English if we can move and she doesn't say anything and then I realize she probably doesn't speak English. Time to try out the Spanish I've been practicing. She says we can move if there are empty seats after they close the doors, and we talk briefly about our trip. This is a good sign, we're understanding each other (more or less). Some of my Spanish speaking apprehension goes away. Randy finds a seat in the very front of the cabin. That means we have to eat on trays that slide out from our armrest, but this minor inconvenience is far offset by the fact that since there are no seats in front of us we have an amazing amount of leg room. Almost as soon as we take off we are served lunch - not bad. Very tasty cheese ravioli, bread, butter, a nice salad, and a small piece of cake. We are plied with wine, water and soft drinks. Perhaps our 8 ½ hour flight to Lima won't be so bad after all. We have an hour stop in Lima and I walk around the airport a bit. 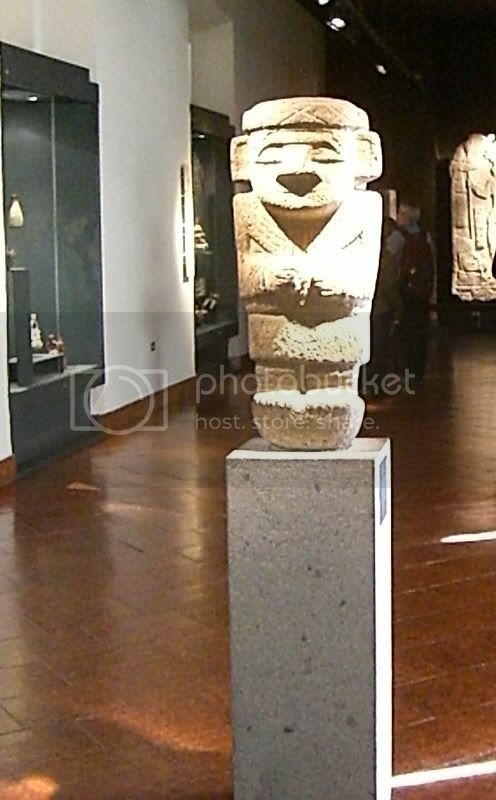 It confirms what I already knew - that I love the arts and crafts of Peru and would like to spend a couple of days there if we can. We will look into flights. As you can see, we're still figuring it out, and I expect we will spend fewer than half our days skiing, the rest touring. Of course if we love the skiing that may change. As usual, flexibility is our keyword. We didn't sleep all that much on the plane and were exhausted when we got to our apartment around 7 am. Santiago time = NY time. We slept until about 2 pm and then took a long walk through the city. It is definitely second world, but seems pretty safe and very interesting. We did what we enjoy, mingled with the people, had empanadas and Coke, walked some more. So far my Spanish is doing me well enough. Tomorrow we will venture onto the Metro and see some historic and cultural sights around the city. 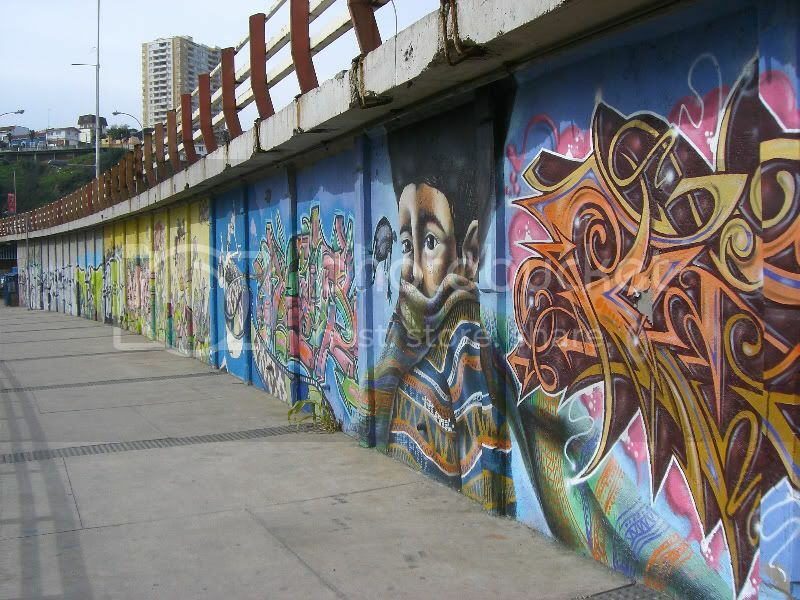 Our plans also include the Barrio Brasil, a colorful part of the city, the Mercado Central where the best seafood is found, and the arts and crafts market in Santa Lucia. 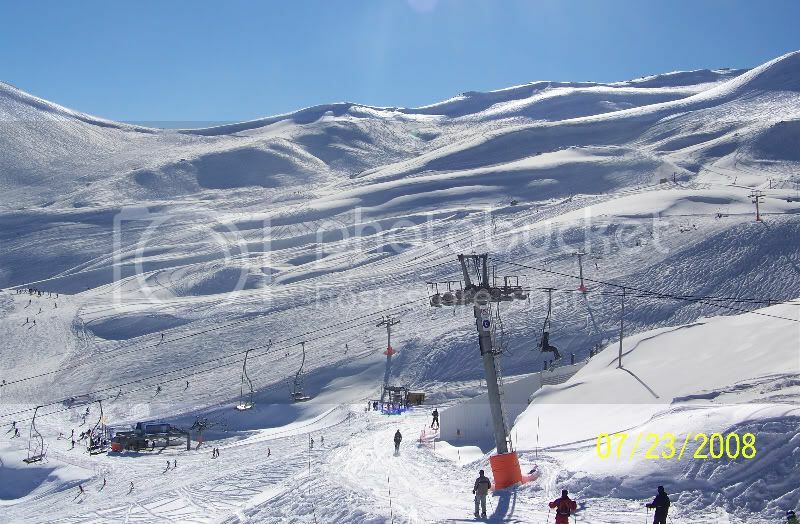 The next day if the weather is good we will go up to ski, probably to Valle Nevado. I've been checking airfares and I don't think a side trip to Lima is in our future, as it's about $750 round trip. Last year Spirit Air was offering extremely low fares to Lima; we might catch a low fare and fly down at another time. We catch a taxi to the staging point for all the buses to the ski areas. Two hours later, after some fun conversation and some hairy switchbacks, we are in Valle Nevado. It's a beautiful area, totally above tree line, just snow and lifts everywhere. Not a lot of people. One high speed quad which we naturally gravitate to. 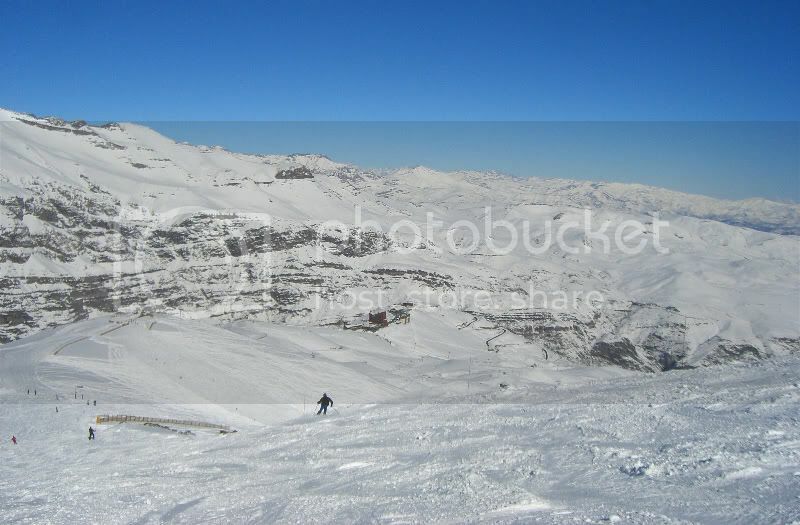 Valle Nevado is 46% red (advanced) runs and we mainly ski those. Everything is well groomed, slightly firm, but highly turnable. There hasn't been fresh snow for a while but conditions are good. Off-piste is skiable if you find the right aspect of the mountain, very crunchy where the sun doesn't hit it. We're skiing with big grins on our faces!!! Now we are really looking forward to our 4 days staying in the mountains! It's hard to hit the ground running when you are not on a tour and don't know your way around. We slept late today, then did lot of walking. Santiago is a fun city for me in that every block may hold an interesting row of shops to explore, not to mention all the items being sold by street vendors. It's kind of like New York - noisy, a bit dirty, polluted - nothing we didn't expect. We went to the bus station and checked on trips to Valparaiso (the sea, about 1 ½ hours away) and also looked into going to Mendoza which is the gateway to Las Lenas. 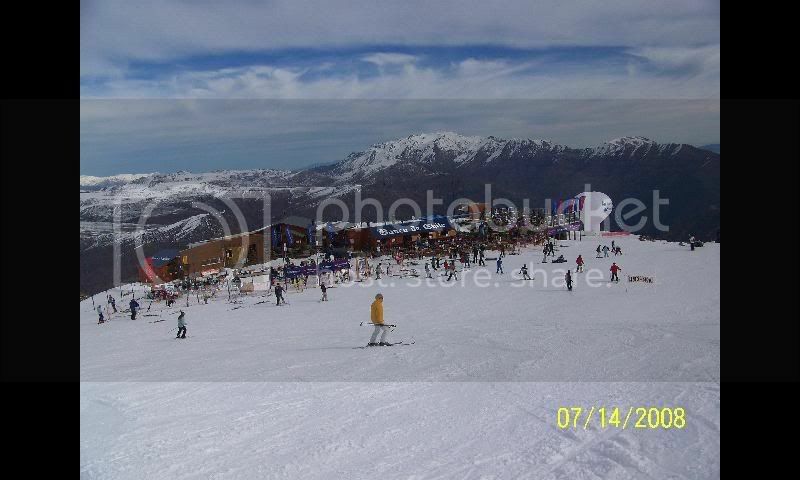 I would like to ski Las Lenas and Bariloche in Argentina on this trip, as it may be our only time in South America. The town of Bariloche sounds like a fun town to visit, kind of like Aspen in the US or Chamonix in France. 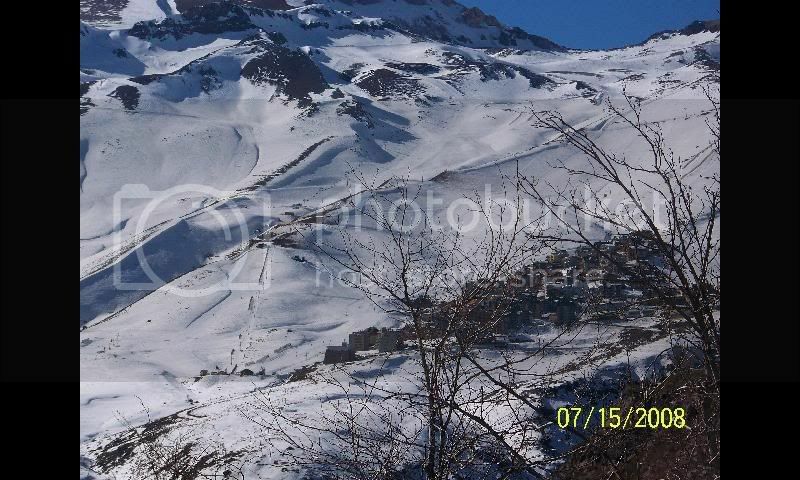 We probably won't ski there, however, as it is the lowest resort and does not currently have good snow conditions. Las Lenas, on the other hand, has a very good base and we really want experience it for a couple of days. Hungry from all our walking, we went for the first of several visits to the Vaca Gorda (fat cow) restaurant. Two delicious filet mignons wrapped in bacon for $10 - enough that we each brought one home and had it the next night with some vegetables. French onion soup, baked potatoes or french fries, and incredible tiramisu for dessert. 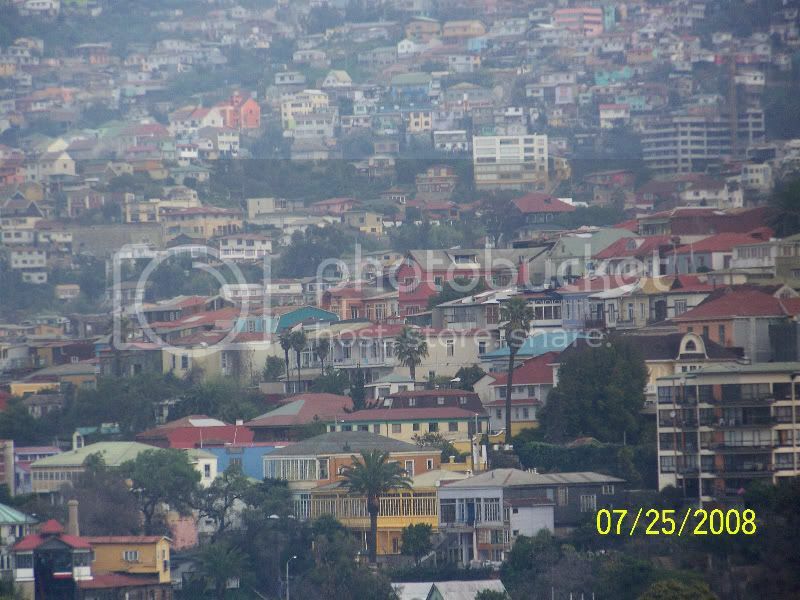 We woke up this morning relatively early, and realized that our trip to Valparaiso must be put off to another day. It was rainy and quite cool, not weather for walking around a beach area. Instead we donned our ski jackets and hats and set out on the Metro which is quite close to where we are staying. 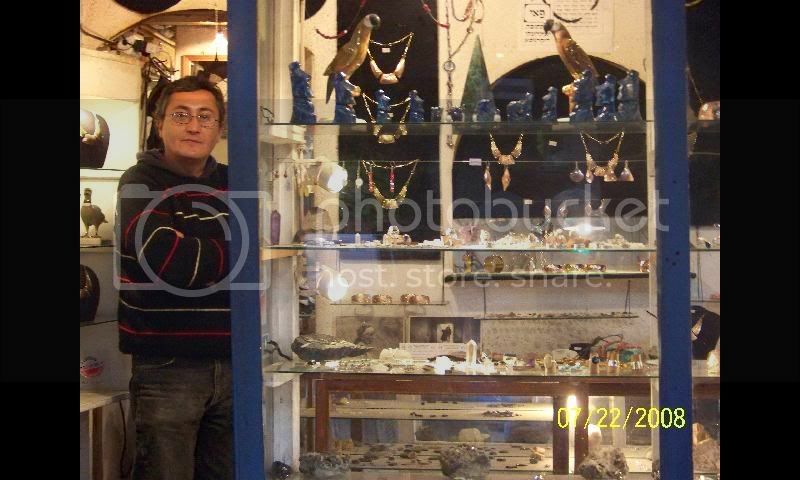 We returned to the Bella Vista section to purchase a lapis lazuli necklace and earring that I had seen a couple of days ago. After looking at lapis in several other places, I decided that this particular necklace would satisfy my need to take home some jewelry made from the national stone of Chile. Again did a lot of walking. Sunday is pretty quiet in Santiago. We sleep late and decide to visit some museums. 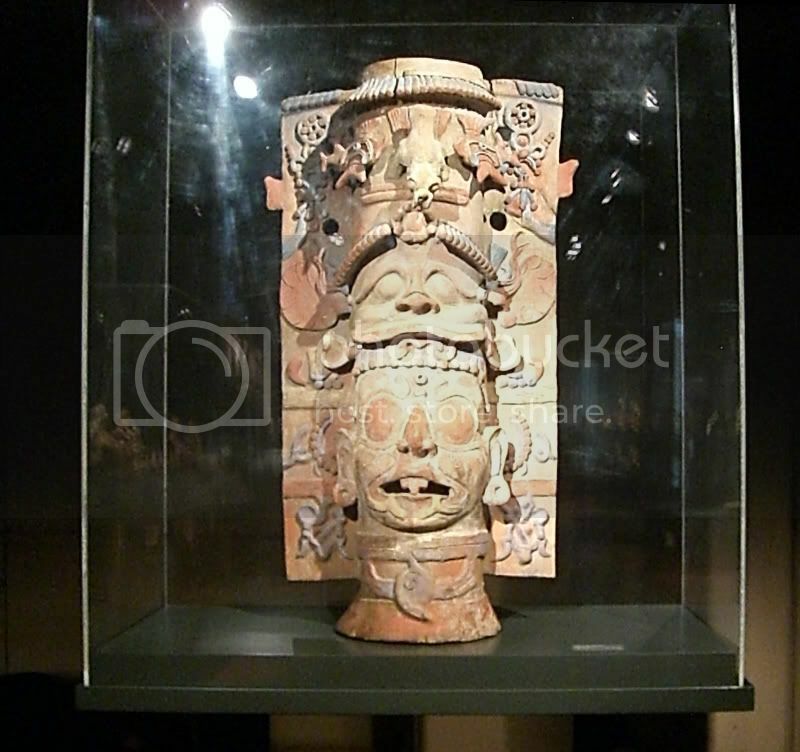 We go first to the Pre-Columbian Museum which is fascinating with artifacts from all of South America. Photos are forbidden but Randy manages to sneak in a few. 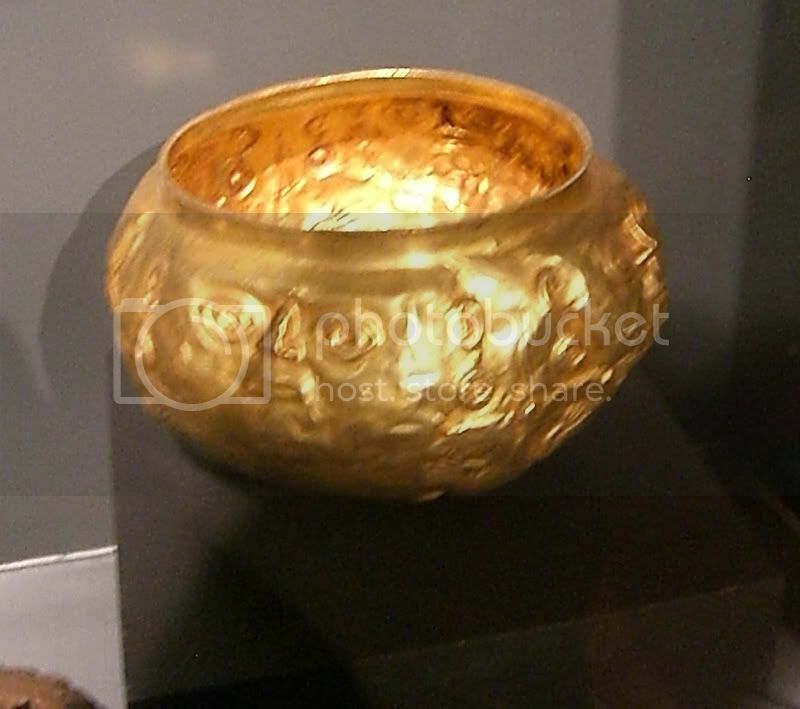 There are some incredible objects. After that we walk around and see a long line of people waiting to enter a building. It turns out to be the Presidential Palace, so of course we join the line. It is somewhat disappointing in that we can only walk through the courtyard area. 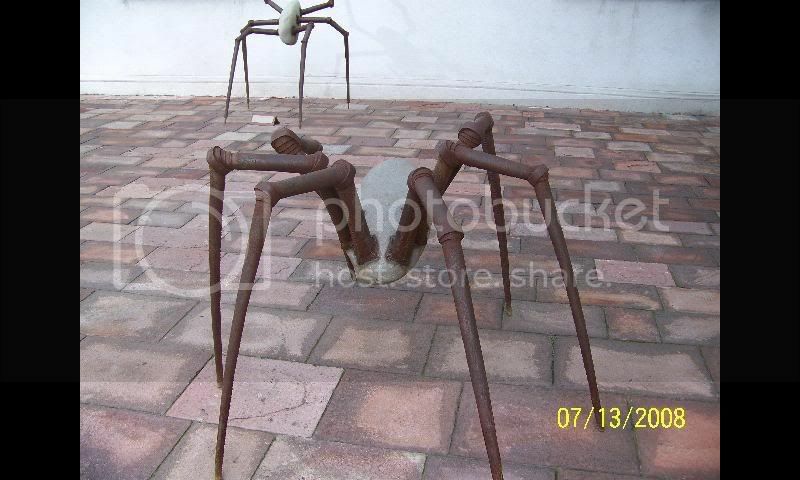 There are some metal sculptures which look to me like alien bugs but are probably pretty famous. Since few restaurants are open, we eat in and prepare for tomorrow's trip up to the ski areas where we plan to ski for 4 days. We get up early and take a taxi to the ski bus pickup. We have put what we need for 4 days into a single suitcase. Along with our skis, poles, and large boot bags, it is still a good amount of luggage. The ski bus drops us off at our hostel, where we have reserved 4 days. Our room is ready and we bring in our stuff and get dressed to ski. It is about 2 blocks to Farellones. Farellones is the lower part of El Colorado, which is today's destination. One poma and 2 t-bars later, we arrive at the first El Colorado chairlift. The skiing is good after a few cm. of snow a couple of days before. At some point my legs decide that no more surface lifts are to be ridden, and we stick to the chairlifts after that. 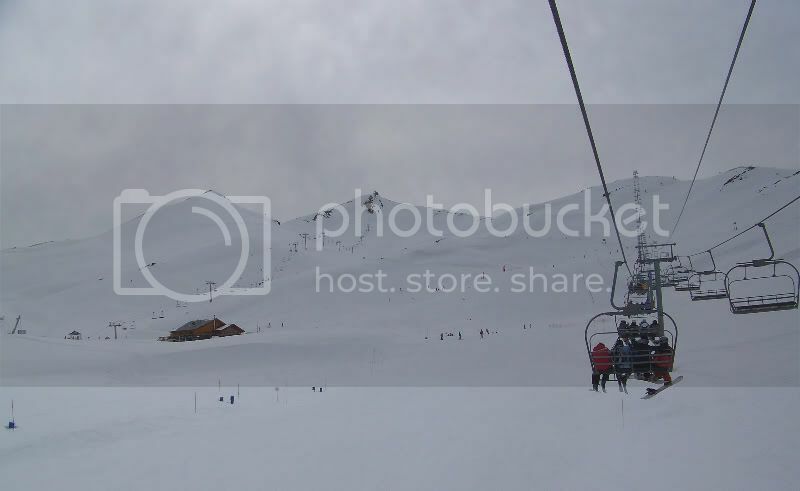 There's plenty to ski, and to our left on the rides up we glimpse La Parva, which is the next day's destination. We return to the hostel and get to chatting with a Brazilian we had met on our bus ride up. 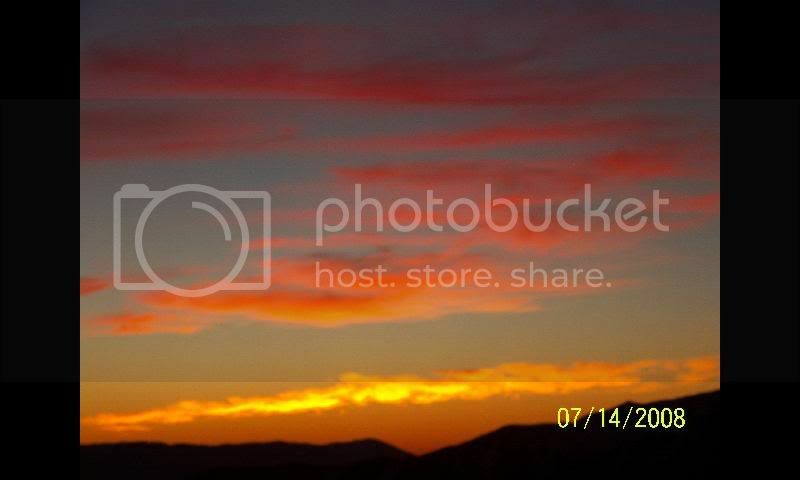 We get to watch a beautiful sunset. We're still in ski clothes when dinner is served. At the table we join an American couple from Bellingham, WA. We chat about their South American adventures, where they have skied in the US, and about life in general. Suddenly it's nearly 11 pm and we're still in ski clothes. We decide to forgo showering and get to bed. Our room has no heat, but the manager provides us with a gas heater that warms up the room (and leaves it smelling of gas). We have 2 bunk beds and Mr. skibum gets the upper one. Its flimsy construction makes him fear that it will collapse and he will crash down on me and kill me in the middle of the night. We snuggle deep into our blankets and finally fall asleep. The next morning we have slept pretty well and I am still alive. Our room does not have a lock, but the manager assures us that it is "no problem". We get up for breakfast, find a couple of Brazilians who are headed by car to La Parva, and return to our cold room to get dressed for skiing. Whoops! - we haven't showered! Whoops! - there is no hot water; the early risers have used it all up. We wait a bit and take quick lukewarm showers. 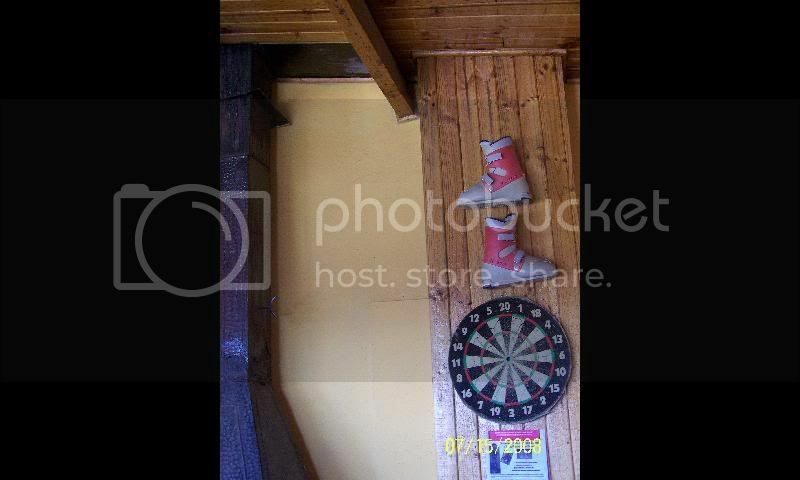 The hostel experience is starting to lose its charm. We make it to La Parva and it is pretty socked in. The skiing is OK but we don't even take any pictures. Except for a few low chairs, it's pretty much all surface lifts. After a couple of hours of skiing, we meet up with the Brazilians for lunch and we all decide to return to the hostel. We have been discussing the lodging situation and decide to check out of the hostel and return to Santiago. We have accomplished our mission, finding out which of the 3 areas we prefer. 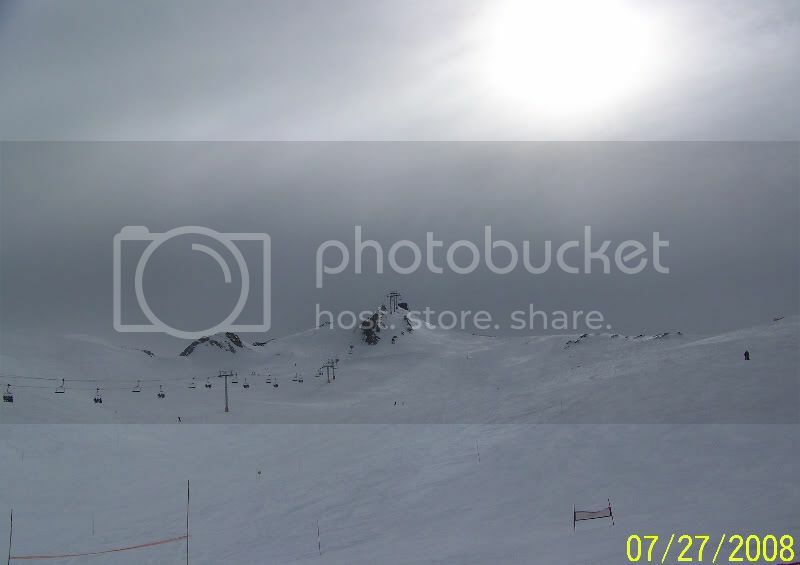 It is Valle Nevado. The hostel manager says he will let us check out with no penalty, as he has another (much younger) couple who wish to extend their stay. He calls for the bus to pick us up, and we head down to Santiago. We had already reserved a room for the night we intended to return, and before heading down the mountain we call them and reserve for 3 additional nights. 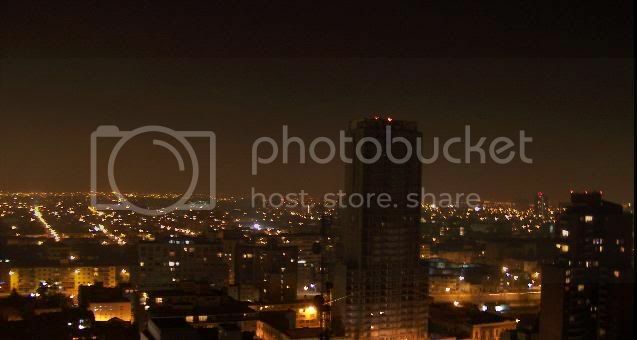 It's a beautiful new hotel called "Santiago Suites", close to the downtown area , overlooking the city. We sleep well and enjoy several long hot showers. Spend the 2 days walking around different parts of Santiago. Purchase a couple of gifts and souvenirs. We again take the bus up to Valle Nevado. As we are putting on our boots in the locker room, we start to talk with an older gentleman whose jacket says "Far West Masters". He is from Berkeley, mainly skis at Squaw Valley, and is spending 3 days skiing at the end of a business trip. He loves Mammoth as well. We decide to join up with him for a few runs and to continue chatting. His nickname is Vlado. We take a couple of quad chair rides together. He is a very good skier with excellent form. However, we are all having a bit of a problem because there are no trees and the light is extremely flat. We work on form rather than speed and arrive at the bottom of each run at about the same time. Then we ski down into a valley from which the only exit is a poma. OK, I can handle that. However, Randy decides to explore for a lower trail. He ducks under a rope, skis into fresh powder, but gives me a sign (crossed ski poles) not to follow him. 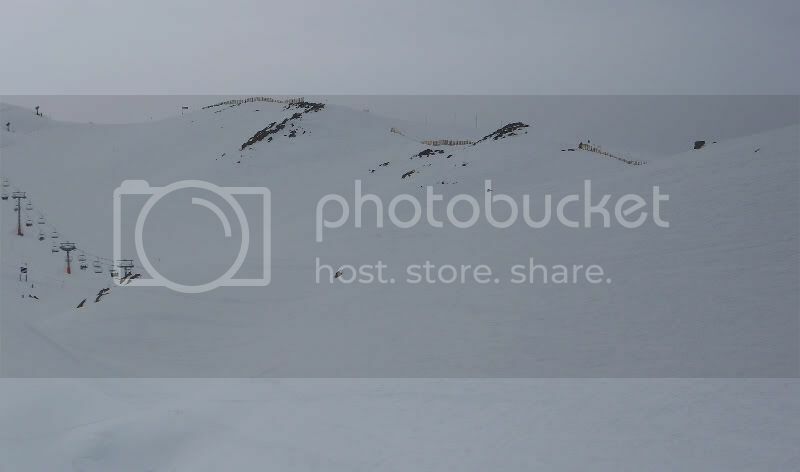 Our new friend and I take the poma up and ski down to the high speed quad. After a couple of runs, I contact Randy by walkie-talkie. He says he is OK and has decided to climb back up as he reached a point in his ski down where it was impossible to continue. I am pleased to hear this as I have looked at the trail map and it looks as if he was skiing down into an area from which there is no escape. We agree that he will call me again when he is back to the ski area. Some more runs and about an hour later, we talk again. He says he is OK and is climbing along the side of the mountain. In spite of his assurances, this is starting to sound not so good. Another hour or so passes and I have not heard from him and can't raise him on the walkie-talkie. It's 3 pm, getting colder and there are only a couple of hours of daylight left. Vlado and I decide it is time for a chat with Ski Patrol. We tell them where he left us and where he was heading. About then we make contact. 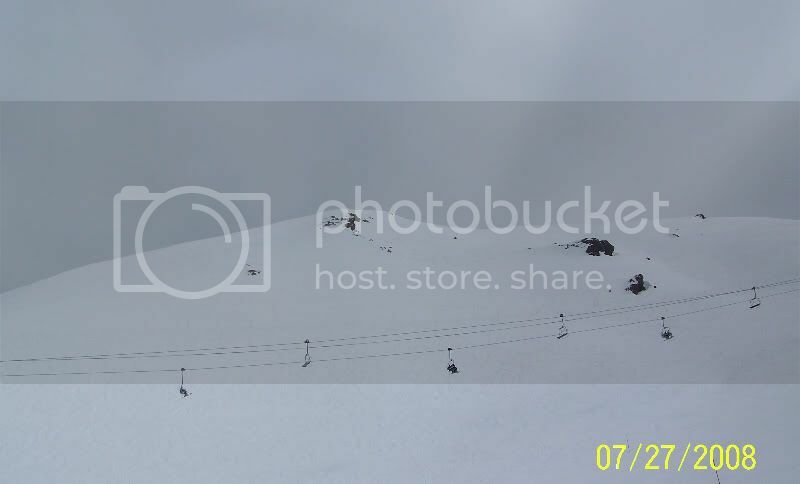 He says he is in sight of the poma lift but in is very soft snow and is not sure he will make it out. Time for a rescue! Yikes! Vlado and I are very worried but within 15 minutes Ski Patrol says they have spotted him. They eventually send a snowmobile to bring him out to the poma. The snowmobile breaks down about halfway and he is back to walking, but at least he is not alone and Ski Patrol advises him on the best way to walk. Meantime it is getting later. I am skiing with a Ski Host who is giving me status reports. We decide to ski to the bottom, walk over to our bus, and tell the driver that we may not be ready to leave by 5. The Host kindly accompanies me as I am afraid that my Spanish is not up to explaining this complex situation. The bus driver agrees to wait until 5:30. I walk back to the ski area and wait in the locker room. Randy shows up at about 5:05. He is soaked, exhausted, but alive and not hurt. We change into our sneakers, grab all our equipment and make it to the bus by 5:20. Everyone cheers as we arrive. Not sure if they are cheering because Randy is alive and safe, or because his arrival means they can finally start the journey back down the mountain. He spends a while describing his day and drinking a lot of water, then dozes off as we descend. We had planned to spend the day at Portillo but when we wake up at 6 am we are not inspired. I have not slept well and Randy's big toe nails have turned black and are very sore. I look at his feet carefully for any sign of frostbite, but apparently the only effect of the previous day's adventure is that he will probably lose his nails and they may not be completely grown out by November. We decide to go back to sleep. We spend a slow and relaxing day doing some walking and taking it easy. Ski bus to Valle Nevado. By chance, we meet up with Vlado in the locker room. I had emailed him that Randy was OK, and he is interested in hearing the whole story. On our second run, I have a collision with a telemark skier who just clips my tails but I fall - hard - on my head! Thank you, Giro. Despite the helmet I am briefly knocked out and have very little recall of the incident. By the time I am put back together, I know my name and where I am but still don't know (or care) who the President is. Randy decides I should sit in the cafeteria for a while. We lose Vlado and never meet up with him for the rest of the day. After a short break (by now I know who the President is, but still don't care!) we go back out and hit the slopes. The skiing is great but the weather is getting worse. It starts to snow and visibility briefly drops to almost nothing. My head hurts and I decide to sit out a couple of runs. Later the weather improves and I rejoin Randy. 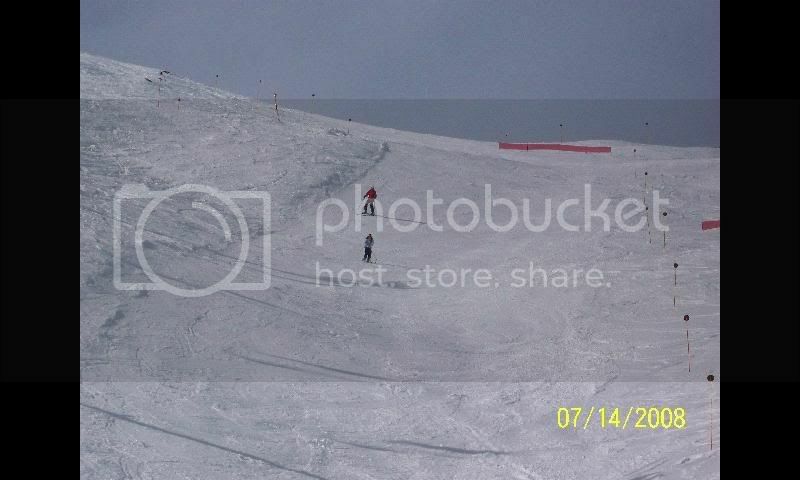 We take a couple of more runs, then hit a slope we haven't skied before. 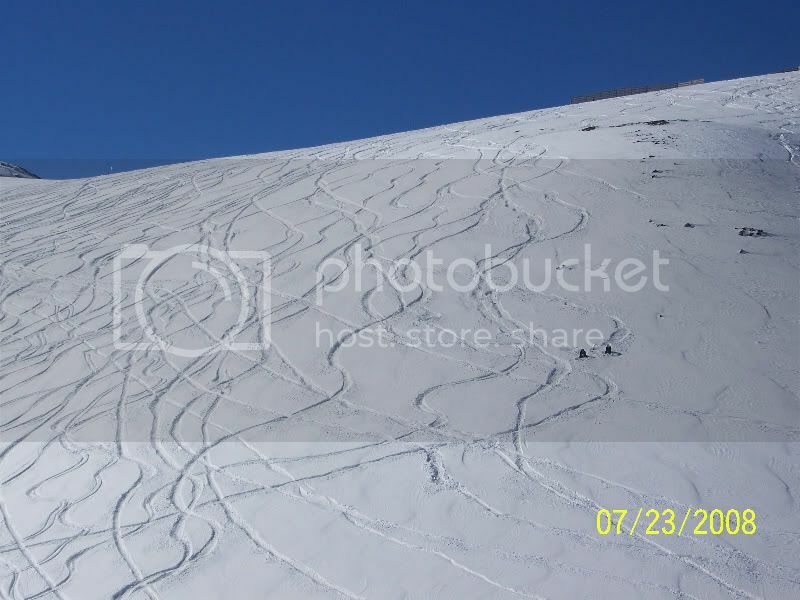 It is a black slope, but groomed and not really that steep. About half way down a cloud overtakes us and visibility goes to zero. Not fun . . . We make slow tight turns down and hit a narrow cat track. I follow Randy very closely, and figure that if he goes off the edge I certainly won't follow. After a while we catch up with some other skiers who are as lost as we are. We all make our way down slowly until we get below the cloud. Time for lunch. At lunch we meet a Brazilian who attended the same conference as Vlado. We chat a while and then notice that it is temporarily clear, so we finish quickly and head out for a couple of more runs. We are supposed to be at the bus by 4 today, an early start because the weather is bad. It is snowing lightly as we ride down to Santiago. Almost as soon as we get back to our hotel, we get a call from Vlado who is concerned about what happened to the skibums this time. We tell him our tale and decide to meet for dinner, as he is flying home on Monday. 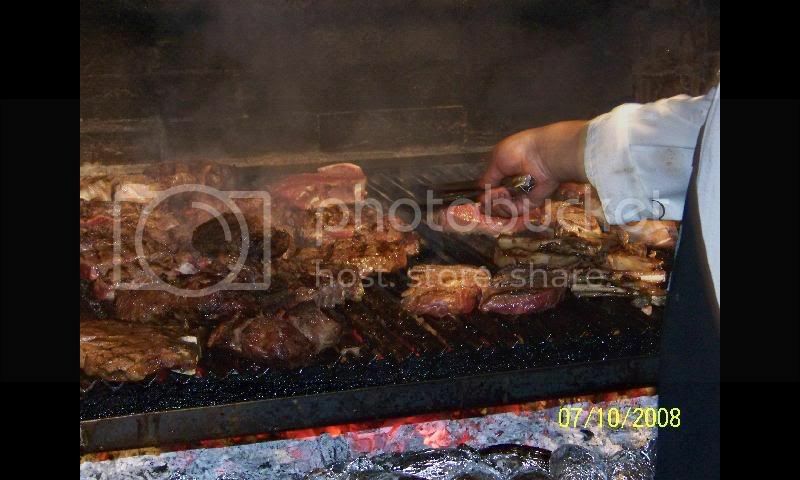 We meet at a seafood restaurant about half way between our hotels, and have a great meal of fresh fish and shrimp. Another day of walking and taking it easy. My legs are a bit tired from the day before. My neck is stiff but other than that I have no ill effects from my fall. We visit a coin and stamp store that we had noticed on another day, and Randy buys a couple of old coins. We learn that there are no self service laundromats in Santiago, and we leave our laundry off to be washed. Tomorrow we will try again for Valparaiso. 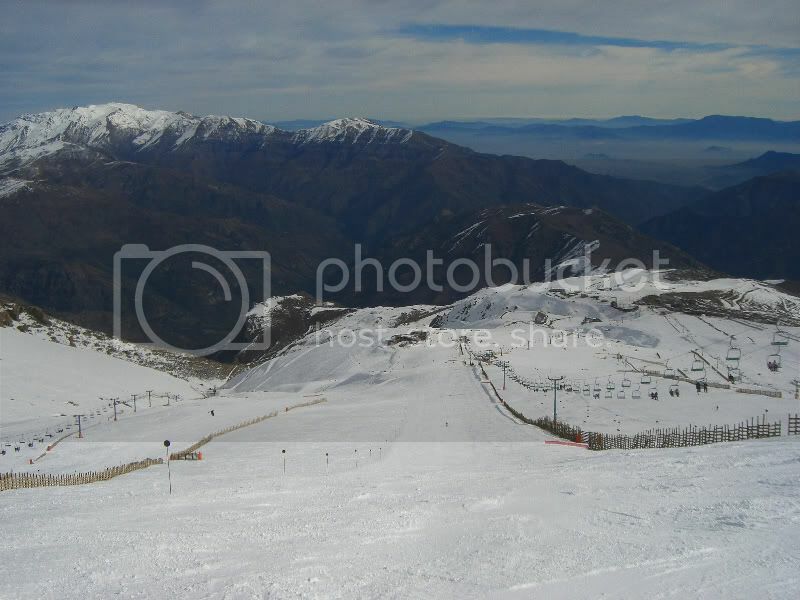 We believe it is snowing today in the mountains, and hope to get back to Valle Nevado on Wednesday. 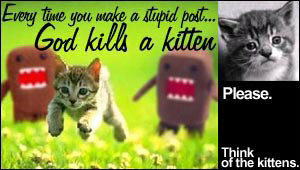 Last edited by skibum4ever on Tue Aug 05, 2008 10:02 pm, edited 2 times in total. OUR ADVENTURE CONTINUES . . . It snowed a bit last night and some more snow is expected for tonight. It was cloudy and cool this morning so we again postponed our trip to the beach. 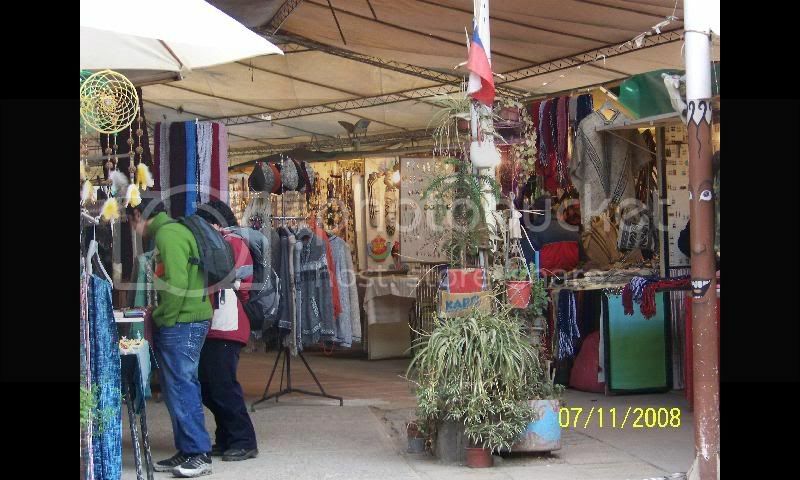 We took a bus very far to the east of the city, and visited the famous market of El Pueblito de los Dominicos. Did some looking and a little purchasing. This market is in the Las Condes (Beverly Hills) area, so it is more expensive but with crafts of higher quality than we've seen elsewhere. There are about 180 artisan studios and shops nestled against the foothills of the Andes. 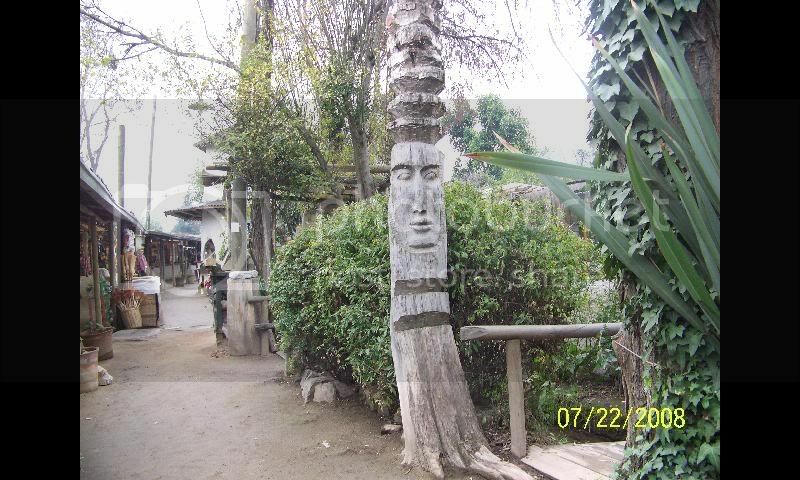 In the craft fair, a shady maze of tall trees and wooden booths, you can find goods from throughout Chile: lapis lazuli jewelry, copper, silver and bronze necklaces, bracelets and earrings, and also paintings and other original artwork by Chilean woodworkers and weavers. Santiago is surrounded by mountains so on a clear day you can see mountains in several directions. On the other hand, it is rare to have a clear day in winter because the mountains trap the smog. It has started to rain at 10 pm, and it is snowing in the mountains. 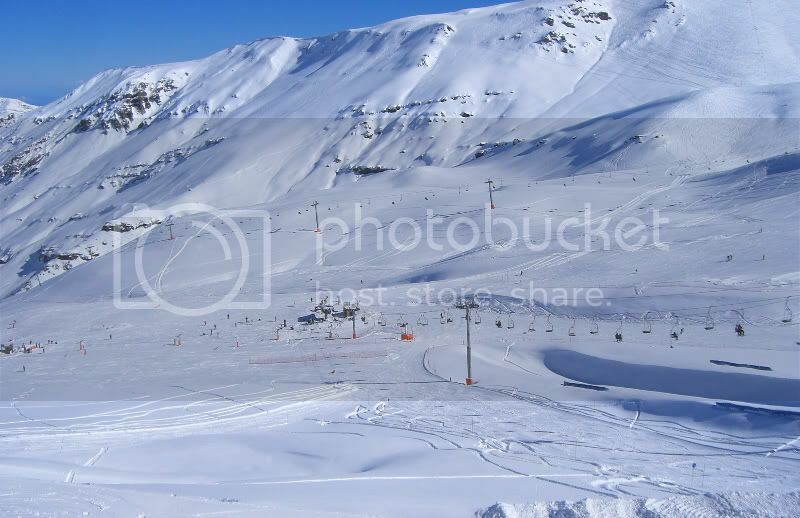 We will be off at 7 am for Valle Nevado. If there's too much snow, we may not be able to get there. But the next few days look to have good weather, so we hope to ski several more days, including a day at Portillo, and also get to Valparaiso, before our return flight on Monday. I am off to sleep for our 6 am wake-up call tomorrow. Powder Day at Valle Nevado! The road to Portillo is closed but the road to Valle Nevado is open. We are delayed by the need to put on chains but finally make it up there. We are greeted by about a foot of the most wonderful powder we have ever skied. It's deep and it's light and we are making perfect turns through fields of powder. 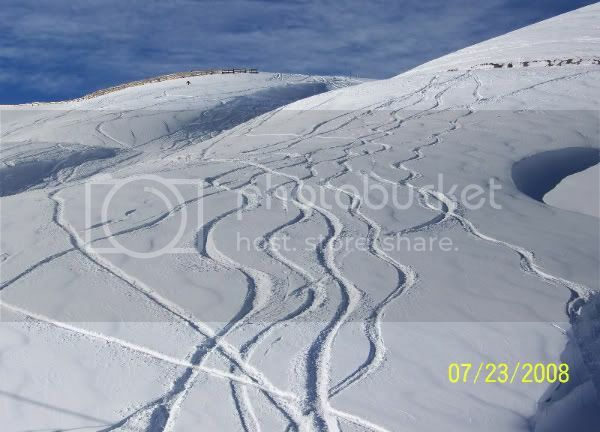 Even late in the day there are areas where you can make your turns without crossing any tracks. On the last run I have gone further afield in search of untracked. I am having the best powder run of my life when I hit a buried rock and take my only fall of the day. 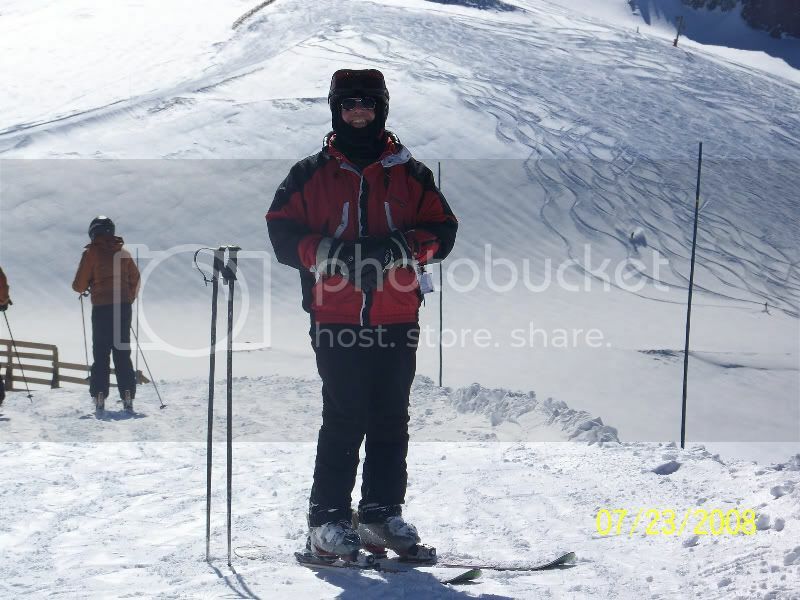 By the time I am dug out and back on my skis, it is time to return to the locker room and then meet our bus. Truly a fabulous day! 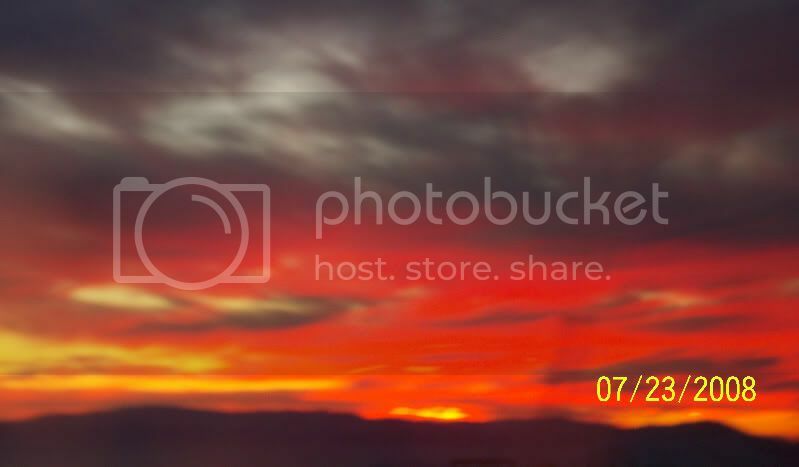 As the color in the sky finally vanishes, those in the bus who are still awake break into a spontaneous round of applause - for the day, the snow, and the beautiful sunset. Looks like a great trip! Thanks for such a detailed report. Thanks, Admin. PM me if you'd prefer a shorter report that focusses more on the skiing and I'll be happy to edit it. 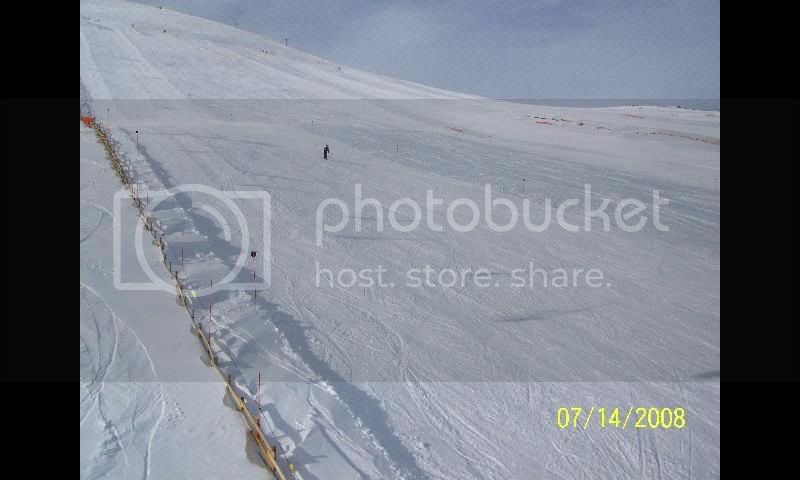 After yesterday's perfection, we have to ski again at Valle Nevado. The day starts out overcast and does not improve. We never even take out our cameras. However, the groomers are great and we find a few areas to make some powder turns. The snow is still fluffy and light. We meet a Chilean woman with two of her children. She speaks very good English. She is a great skier and had previously been a Ski Patroller for 10 years. 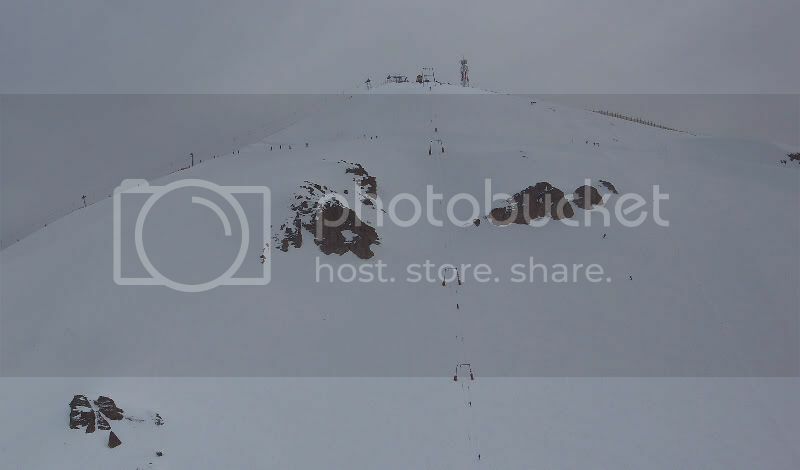 She shows us to some areas of the mountain that we had not previously skied. This chance encounter makes for another memorable day. She offers to take us out of bounds to one of her favorite areas, but the weather is too overcast, the light is too flat, and we all decide it's not a good idea. 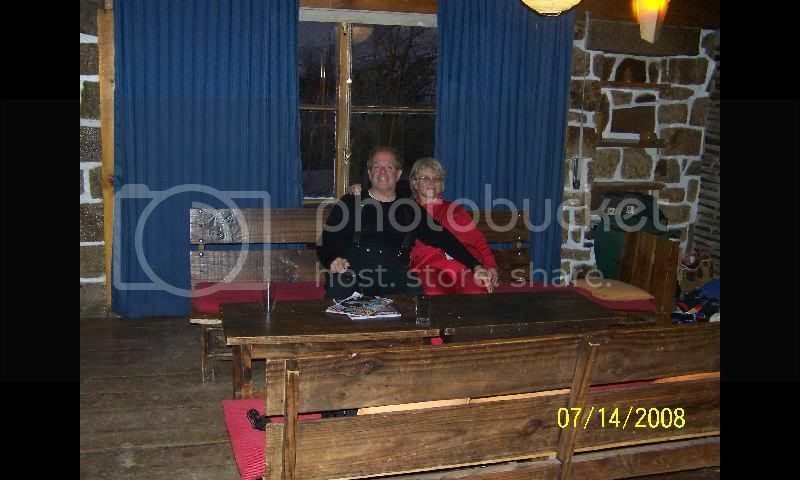 We offer to show her around any of "our" ski areas (Mammoth, Keystone, Vail, etc.) if she should make it to the US to ski one day. It is one of her goals and we give her our business card. We finally take a bus to Valparaiso. 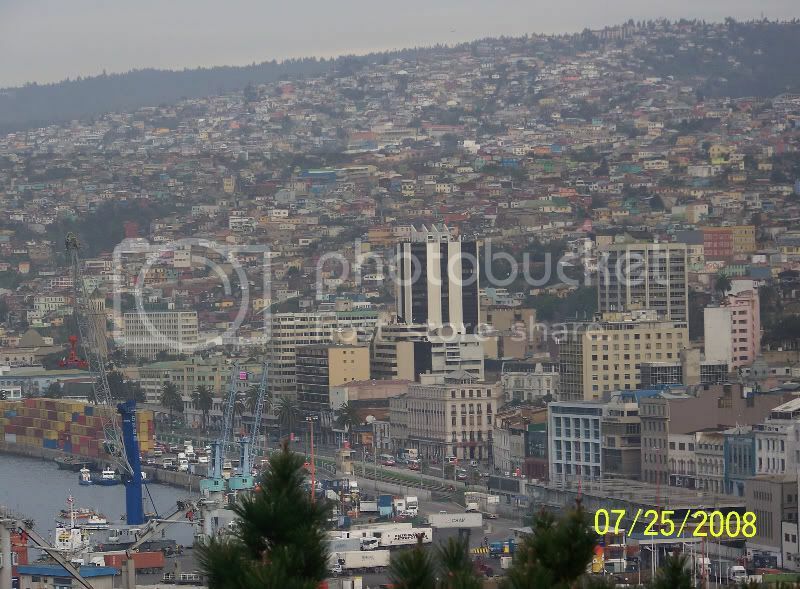 Valparaiso is Chile's principal port and second-largest city. 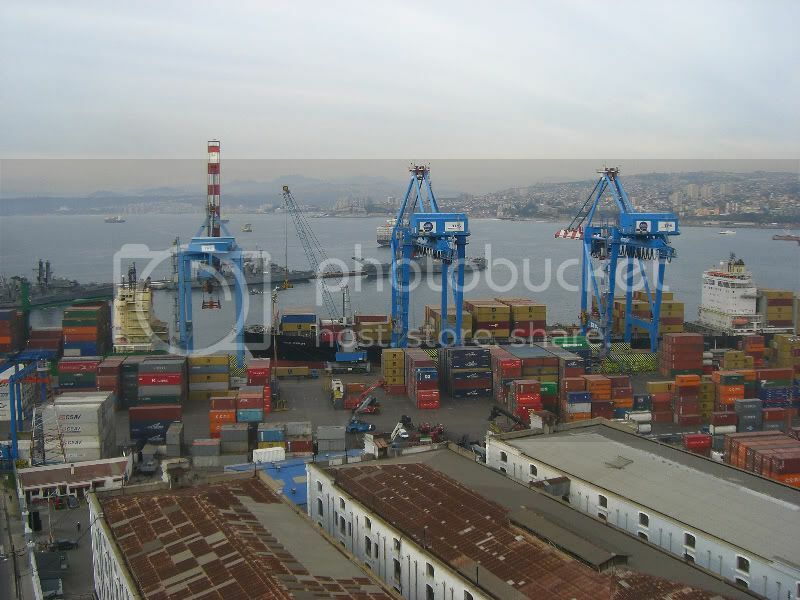 It is situated on a narrow strip of land between the waterfront and the nearby hills. Most of the narrow streets are paved with cobble stones. The hills above the flat area (called the "Plan") are very picturesque. 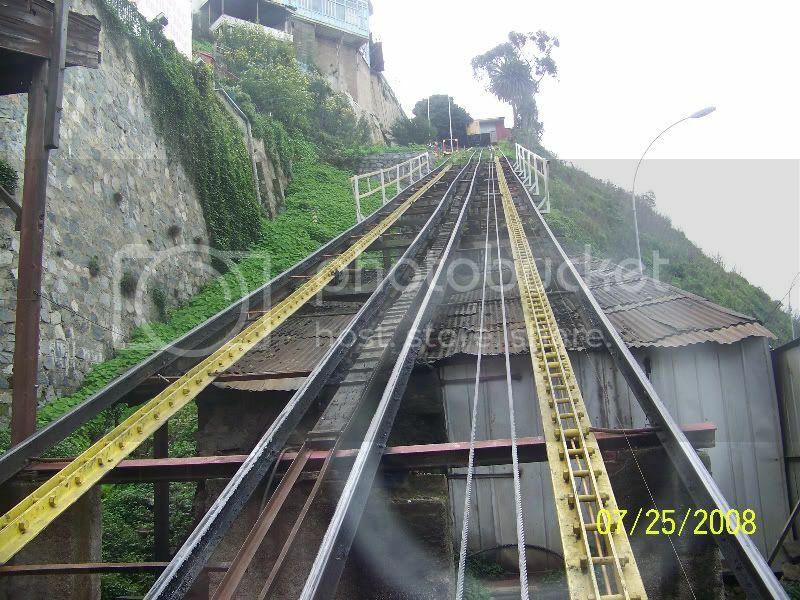 You can get up to them by walking or via an ascensor, a rather rickety lift that takes you round trip for about $1.00. The area is also know for its wineries. 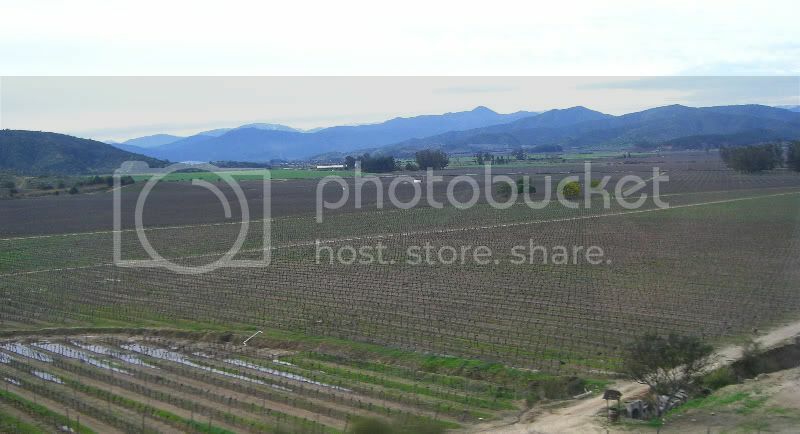 As we take the bus from Santiago, we pass numerous vineyards. The bus lets you off in a poor section of town. 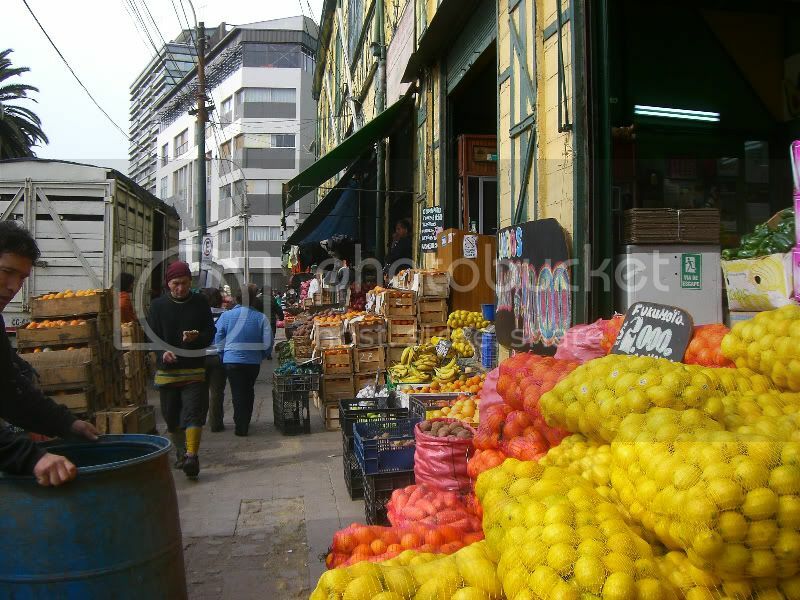 We start to walk and find ourselves on an extremely crowded street lined with fruit and vegetable stands. Walking toward the port we saw these colorful murals (aka colorful graffiti!). We took an ascensor up one of the hills overlooking the port. After walking around for hours, we stopped at a seafood restaurant called "La Otra Cocina". It was inexpensive and crowded, although it was only about 6pm and really too early for dinner by Chilean standards. We ordered paella for 2. It was delicious - filled with mussels, clams, shrimp, fish, chicken, and sausage. We took enough home to have dinner the following night. Today is Saturday and one of the days when buses go to Portillo. Finally! We arrange a hotel pickup at 7 am. We wait for the van . . . and wait . . . and finally call the bus company. They are very apologetic but it seems their driver got lost and went to the wrong hotel. They tell us to take a taxi to the ski area pick up point and they will reimburse us. We flag down a taxi, get there, and are assigned to a van. I ask where we are going. "Portillo", they reassure me. Fabulous! We are the only 2 passengers in the van as the big bus apparently left a while ago. We expect them to cancel our trip. But soon we are pulling out and are on the road to Portillo. We doze for a while until the van stops. 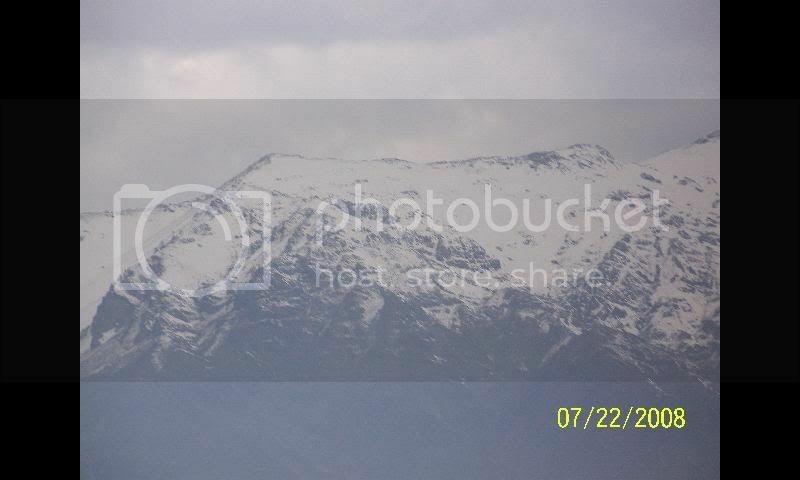 We are close to Los Andes. This is where the road turns east and the switchbacks begin as we ascend to Portillo. The road to Portillo is closed. I had checked it that morning and it was OK, though light snow was forecast. "Snow?" I ask our driver. "Big accident, 2 trucks" he replies. Apparently the road is not expected to reopen until much later in the day. The van turns around and drives us back to our hotel. The driver tells us that he will personally pick us up tomorrow at 7 am. "Portillo?" I ask hopefully. 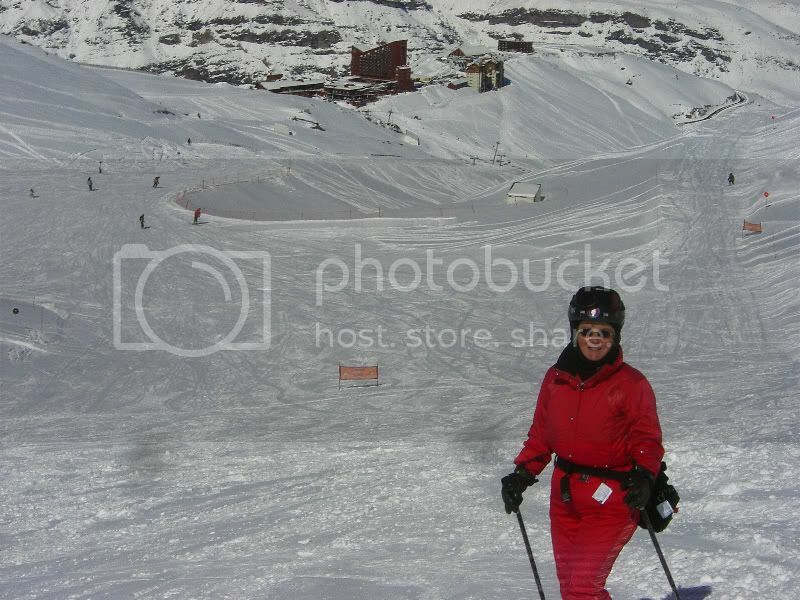 No, Valle Nevado. Portillo is only Wednesdays and Saturdays. Looks like we will not make it to Portillo on this trip. The van picks us up precisely at 7 am. We are off to Valle Nevado for our final day of skiing. We arrive relatively early and are on the slopes for another sunny day. 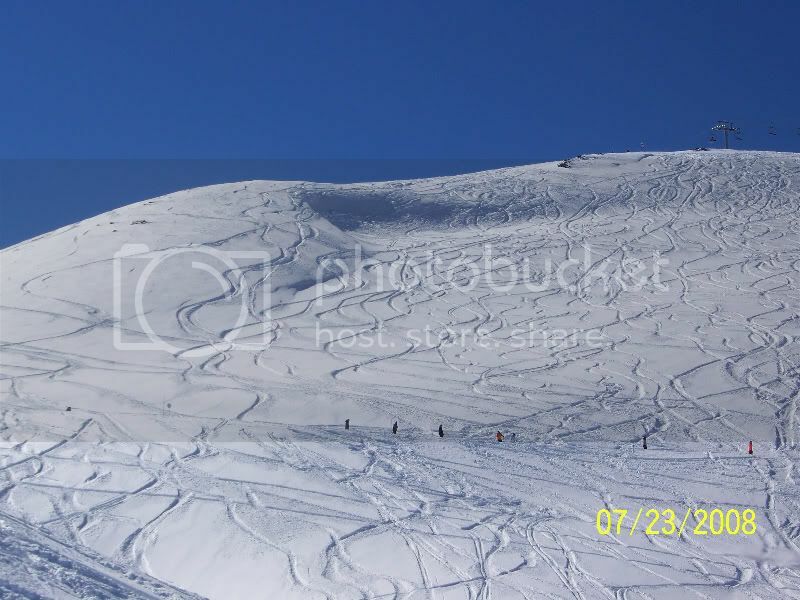 The lower slopes are extremely crowded with beginners and we quickly head higher. The groomed runs are excellent! The powder has set up and is no longer much fun to ski. We are content to cruise. By the time I remember to take some pictures, it has become cloudy once again. I quickly snap a couple of shots. Note to anyone planning a trip to ski in South America, take a pair of goggles which are meant for overcast days and flat light. If our experience is any indication, there are a lot of days like that. Even though the weeks we have been skiing have been "high season" and "school holidays", this is the only day on which we encounter any lift lines. Even the higher surface lifts and the Andes Express HSQ require at least a 5 minute wait. The fun part is that we get to chat with people in the lift line and on the quad chairs. We talk to a Floridian from Boca Raton, a 10 year old from Squaw Valley who says skiing in Chile is "pretty fun", and a ski instructor who is teaching a group of 4 year olds. He tells us that is the perfect age to learn to ski. From the fun the kids are having I certainly believe him, and wish again that I had learned at that age. 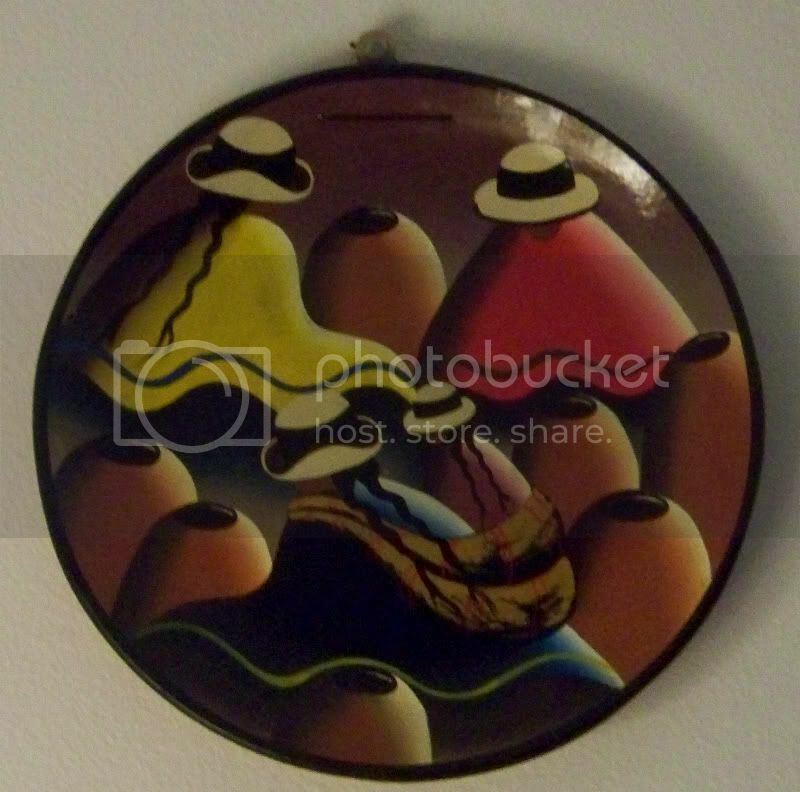 I purchased this ceramic plate from the Santa Lucia market on the last day. After packing we spent a couple of hours walking around, buying some gifts that we had seen and not purchased, and again like the first day eating street food. I found that my Spanish had improved. We got to the airport really early for our 9 pm flight, and got home about 7 am on July 29. We discussed volunteering to give up our seats if the plane were crowded, and grabbing a few more days of skiing. But the flight to Lima was about half empty. From Lima to LAX was quite full, but by then we and our stuff were on the plane, and it was time to come home. Of course the powder day gets a 10++. - go after the school holidays, not necessarily because of crowds but because prices will be lower and there may be more snow. Maybe Aug. 1-Sept. 1. - work a little harder on Latin American Spanish which is way different from the Castillian Spanish I learned in high school. Maybe even take a class. Skibums over and out . 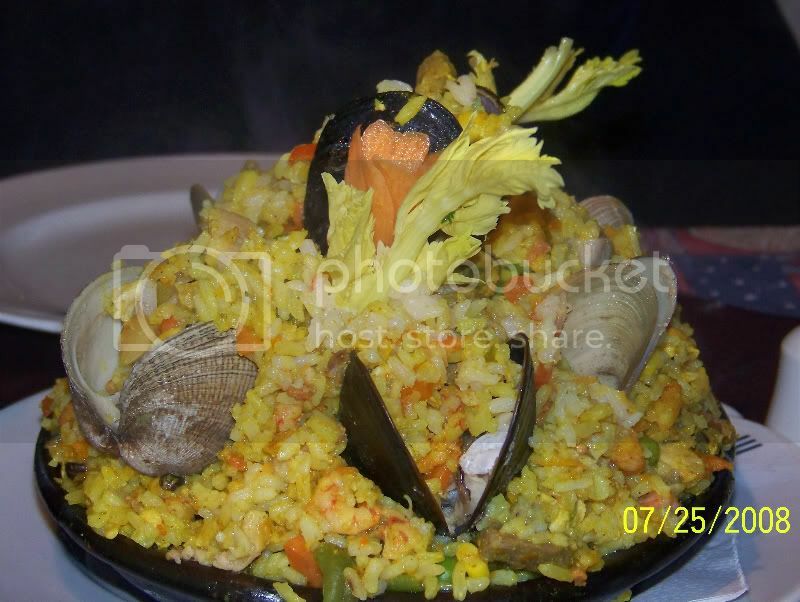 . .
Oh gawd, that paella looks to die for! 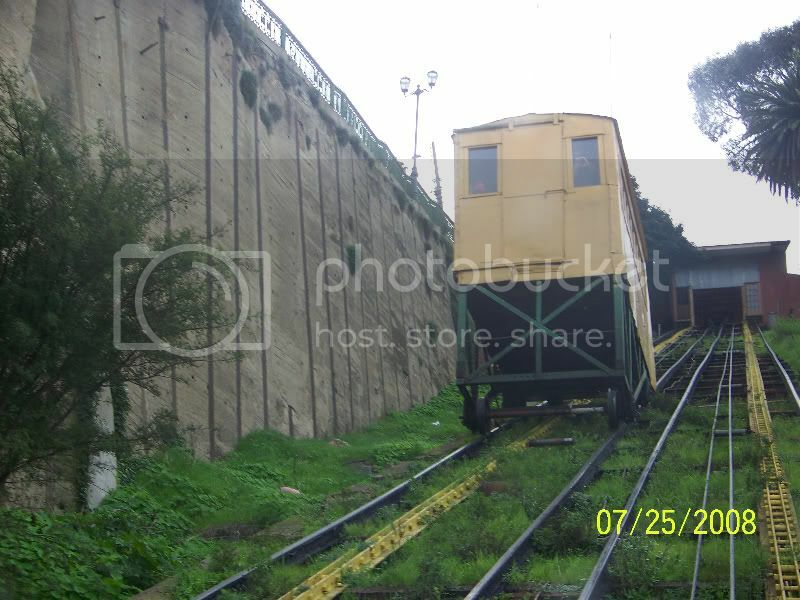 And that ascensor in English, FYI, is a funicular railroad. There's a cool one in Quebec City that ascends the river bluff. 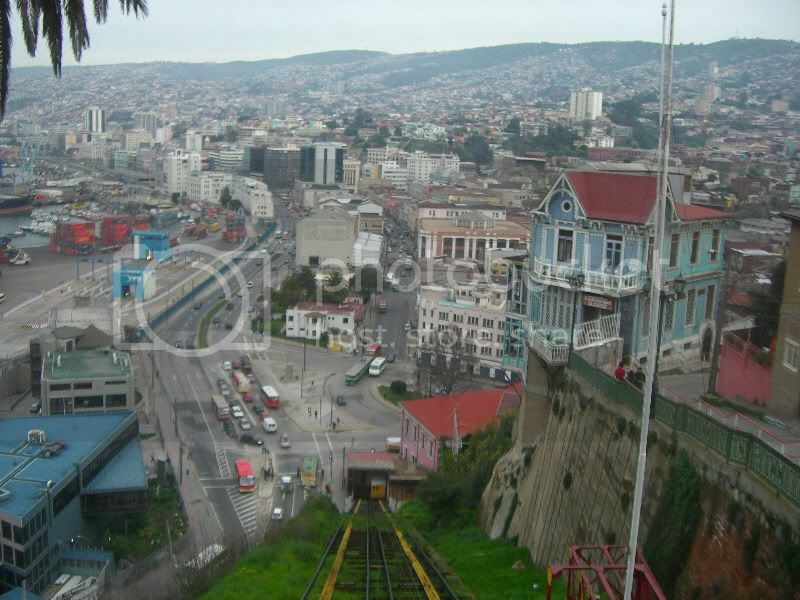 There are many of those private funiculars in Valparaiso. I'm amazed at the patience and stamina. This is not the way I would have wanted to do that trip. I'm puzzled that you didn't rent a car, especially since you were doing well with Spanish. It would have helped particularly with Valparaiso and Portillo. We also have divergent opinions about the ski areas, but that's personal preference. I'm not surprised with the bad visibility stories. Randy of course ventured into that powder below the lowest VN poma. Very poor planning not to put in one more lower lift down to the road, which would also open up a tremendous amount of terrain coming from El Colorado. Santiago is cloudier than L.A. except late spring, which has that reputation in L.A. Do the Andes in some way hold clouds over Chile's Central Valley? Average high temps are similar, but L.A.'s are warmer in winter and cooler in summer. L.A. is closer to the ocean. Average low temps are consistently higher in L.A.: ocean proximity in winter, more humidity in summer. Record highs are higher in L.A. from the Santa Ana conditions, which have no analogy in Chile due to the higher Andes barrier. Record lows are higher in L.A., but by a modest amount. L.A. is closer to the ocean. L.A. is more humid in summer (ocean) but less in winter (clearer skies). Santiago's 15-inch rain total is very close to L.A.'s. All other "Mediterranean climate" cities I could find get at least 20 inches. 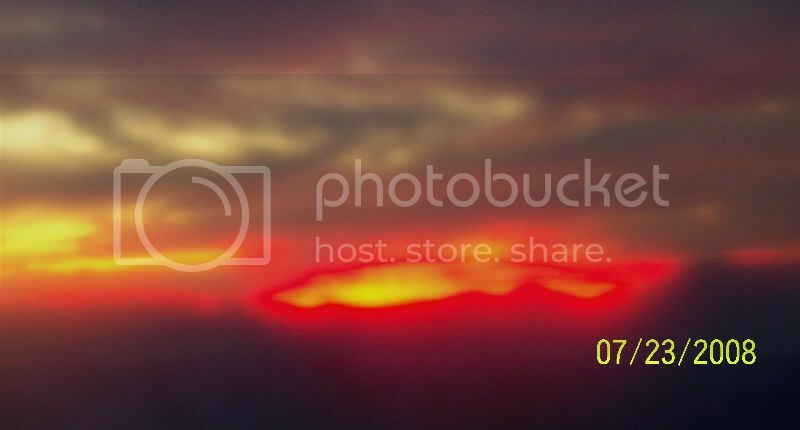 Santiago rain peak brackets the winter solstice. L.A.'s is offset later by at least a month. I always assumed that coastal California's "offset seasons" were due to the cold ocean current gradually warming during summer. Since Chile's ocean current is even colder, I would have thought Chile would also have offset seasons, but it clearly does not. The offset seasons appear to be an interaction between the cold ocean and the very hot inland deserts in California. So in September not only is the ocean warmer, but there is less desert heat to draw the cool coastal air/fog onto inland. FYI coastal Peru has a fog season even more dominating than central California. But at its tropical latitude the summer sun is what makes it dissipate. Lima averages only one sunlight hour/day June-September, and only 1.69 inches annual rainfall.